The classic line up of the Clash lasted for five years from 1977 to 1982 and featured lead vocalist and rhythm guitarist Joe Srummer, lead guitarist and vocalist Mick Jones, bassist Paul Simonon and drummer Nicky ‘Topper’ Headon. Give ‘Em Enough Rope, the second studio album, was released on 10 November 1978. The album was a huge success and by 1979 the Clash had begun to make serious inroads into the US market. 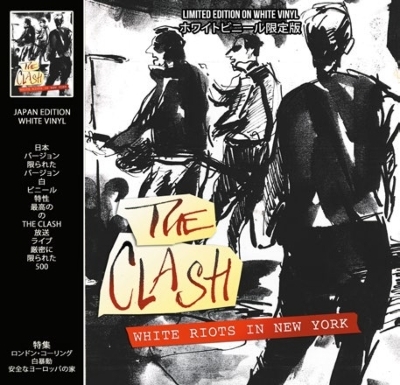 White Riots In New York is the legendary Clash broadcast from The Palladium NYC on 21st September 1979. This powerful recording captures The Clash at the peak of their form performing material from Give ‘Em Enough Rope and The Clash and their soon to be released third album LondonCalling. Featuring Cover Illustrations by Ray Lowry - The Official Clash ‘War Artist’, who toured with The Clash and sketched them on stage and in rehearsal.